With Chinese New Year a month away, gathering the family together can be a feat, especially with conflicting schedules among relatives. So, why not lessen the headache of preparing a feast for the fam, by heading down to Amara Singapore’s Chinese New Year Reunion Dinner? Happening on 15 February, at 6pm, the lunar new year bonanza features an 8-course spread for revellers to choose from, as well as yusheng arranged in the shape of the Dog, in commemoration of this year’s zodiac animal. And on that ever so encouraging note, I embarked on my attempt at the Korean Fire Noodle 불닭볶음면 Challenge. Ranked third on The Ramen Rater’s Top Ten Spiciest Instant Noodles of All Time 2014, 불닭볶음면 – which roughly stands for Hot Fried Chicken – has recently gained infamy for making the hardiest of spice seekers surrender in agony. So intense is its flavour, that people worldwide have challenged each other to finish one serving in the shortest time possible… or finish it at all. Hmm, fire noodles, ALS ice bucket – why do most viral challenges these days involve hurting ourselves physically in one way or another? The trouble with living in Singapore is that you’re constantly surrounded by a myriad of mouth-watering delicacies that hail from all four corners of the world. To the effect that “What shall we have for lunch/ dinner?” sparks off an unsolvable dilemma, day after day. And let’s not forget those fusion and concept restaurants that have popped up around our sunny island. Sometimes, I secretly wish that I have an expandable tummy just so I can eat all the food I want, without risking a tummy ache or worse, growing a second me! 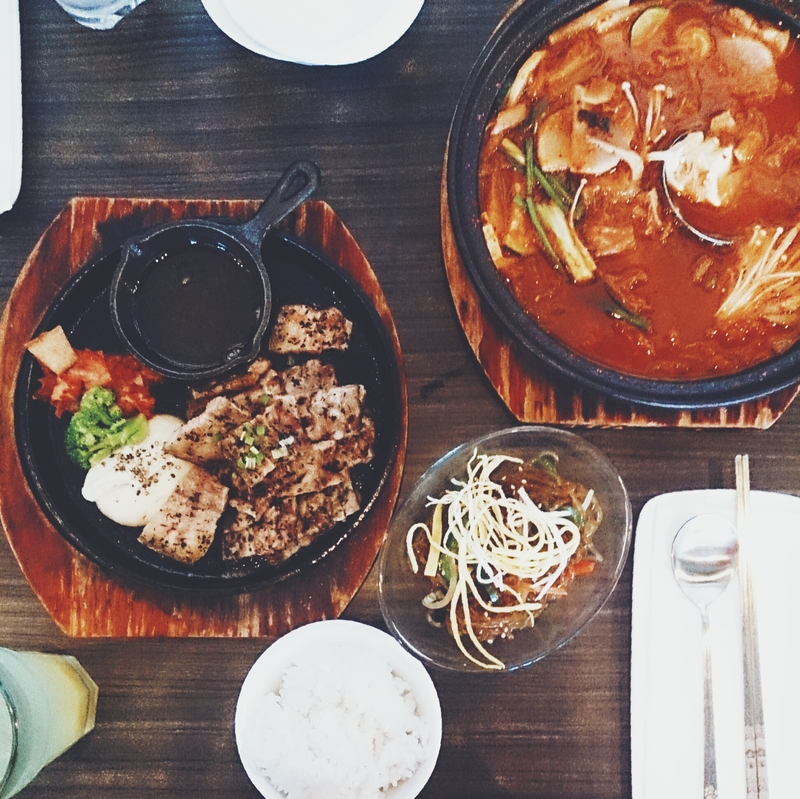 First world problems aside, we made our reservations at Sarang, an up and coming Korean restaurant that has garnered a lot of hype for its Korean tapas dining concept (or so they say). Located on the upper levels of Orchard Central, Sarang has a gorgeous alfresco dining area that commands a picturesque view of Orchard Road and beyond.